Congratulations! We’re so excited to have you onboard with us and we can’t wait to meet your family! BEFORE THE MEET & GREET, we advise you to purchase a lockbox for your keys. You can add the combination/code for the lockbox into your online profile, with us. If we have to make a separate trip to pick up or return your keys, before or after the scheduled pet sitting services, there will be a charge for a Pet Sitting Standard Visit that is applied to your provided payment method. You can purchase a lockbox from any local hardware store or online. 2. We make every effort to ensure that the pet sitter or sitters you meet will be the sitter or sitters caring for your pets. However, depending on availability, your sitter or sitters may or may not be at the meet & greet. A manager, sitter, or sitters from Fur Heart will always be at the meet and greet. We work as a team and stay in constant contact. 3. Don’t be surprised if sitters are a little quiet until they meet your pets. A lot of talking can create excitement and could influence your pet’s behavior in an unwanted way. 4. 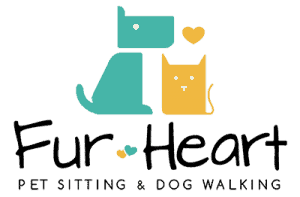 The sitter or Fur Heart representative may want to stop at the entrance and kneel down as to show your pets that they are not a threat and make them feel comfortable in each other’s presence. Please be patient. 5. If they don’t show your pet affection by petting them, it is because they haven’t felt that your pet has given them the O.K. to do so. If and when your pet makes them feel comfortable to show affection by petting them, the sitter or Fur Heart representative will do so. 6. Don’t be surprised if at any point your sitter wants to take video documentation of things related to the upcoming pet sitting visits. 8. During your tour, your sitter or Fur Heart representative may ask question as to clarify certain things. 9.Feel free to ask us any questions you may have. We’re here to help! A signed copy of the contract agreement (unless you have already emailed it back to us). Written list of every task you need your sitter or sitters to do, while you’re away, and specific instructions for these things, if necessary. 2 spare keys (unless you have a keyless entry with a code or some variation of that). If applicable, this is required for yours and your pet’s safety. One goes to your sitter and the other stays at the office. If necessary, home alarm instructions and how to turn it off, if it accidently alarms. For overnight pet sitting, it’s much appreciated to leave a Wifi password on your sitter’s to-do list, if you have one. All the information gained during the meet-and-greet will be shared with your specific sitters as well as management, so everybody will be on the same page and capable of achieving the same, high level of, quality.